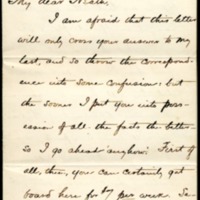 I am afraid that this letter will only cross your answer to my last, and so throw the correspondence into some confusion: but the sooner I put you into possession of all the facts the better—so I go ahead 'anyhow.' First of all, then, you can certainly get board here for $7 per week. Second, the Executive Committee of our Board of Trustees has definitely sanctioned the 'supposed case' put in my last letter and thus made it an official plan. The reason that they cannot offer more than $600 for next year is that they will have to organize at once a department of Physics and will have to expend some four or five thousand dollars in building the necessary room, obtaining apparatus, paying a teacher, &c. After next year they would, of course, hope to pay more—though, like the cautious Quakers they are, they never promiseanything, but only do as they have the means. It amounts to the same thing in the end.They adopt here the gradations of rank in the Faculty which are in vogue at the Johns Hopkins. There are first 'Associates,' engaged generally for any term from one to two years; 'Associate-Professors' (the rank to which I have now been advanced) who are usually contracted with for three years; and 'Professors,' who hold during good behaviour. Your title would be 'Associate;' and, after all, for five hours work per week, $600 would be about in proportion to the salary usually given here for full work by an 'Associate'. It's little enough—especially as offered to a man who is already getting $400 more; but it is more than we are to get one or two other assistants for next year, who are men with the most thorough University equipment, but who are willing to take next to nothing (one of them $400, I believe) for the sake of obtaining congenial work with prospects. The $7per week board means just as good board as that which costs more—the only difference is a room in the third story instead of in the first or second: and the room seems to me as good as any. If Mrs. Wilson and I can manage to keep house next year we shall invite you—in case you decide to come—to take a room at our house at any rate, even if Mrs. Wilson should not be equal to taking you as a boarder.Now, my dear fellow, I will not advise you to say 'I'll come', because I could not for the life of me decide whether I was giving the advice selfishly or unselfishly. I may note a few considerations, however. I sh. say, in the first place, that the prospects for salary here would, on the whole, be quite as good as where you are. The conditions of work here are certainly very pleasant; and in history work—especially American history—the Phila. libraries are not inadequate,—are, indeed, very good. Then, too, this is “the East,”—which, from the student's and literary man's point of view, is a great advantage. One can lecture five hours a week and still have some time left for his own private enterprises of study. Altogether, I've come to the conclusion that I could hardly find a better place for work, until the special chair in comparative politics for which I am waiting turns up. “Professing” is not just the ideal life even for a student: but I suspect that there is as little vexatious friction about it here as anywhere. Since one must struggle with classes, he ought to be thankful for so comfortable a berth—where the classes are docile, intelligent, and willing,—where the administration is honest, straightforward, and liberal,—and where there's sympathy to be found in one's work for the searching. Wilson, Woodrow, 1856-1924, “Woodrow Wilson to Richard Heath Dabney,” 1887 January 25, WWP20429, University of Virginia Woodrow Wilson Letters, Woodrow Wilson Presidential Library & Museum, Staunton, Virginia.